With a 2 seat design, this SONGMICS Bamboo Shoe Bench is a functional decoration for your doorway, entryway and porch. It not only can store all kinds of your shoes, but also offer you a comfortable place to sit on. With the special designed round corner and counter bore, it is even safe when you have children around. Different heights of levels allow kids to sit on, make the shoe changing more comfortable and fun. Shipped with reusable embedded hardware, easy to assemble and disassemble. Putting this slim space-saving bamboo shoe bench on the doorway, you can put your handbags on the top while sitting on it to wear shoes and put them on the shelves. It is also a good idea to put your plants on it, while use it as a towel or toiletries rack in the shower room. Mothers can put your baby toy baskets on the shelves to storage. More features are for you to find. - Please be aware of the SIZE for this product, and buy accordingly. 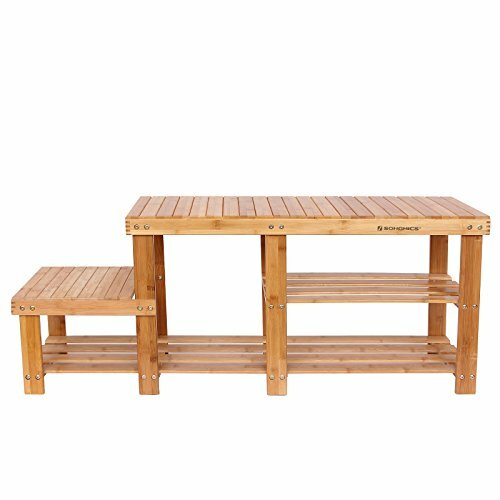 - Since the bench seater is made of pieces of bamboo boards, it might creak when you sit on it. That is considered normal, because some bamboo boards bended and went down under pressure. - Please sit gently and contact us if any crack happens to it.